FROM EAST -Continue Past PO on Right - Next Left into Church Street then Right into William Street. "Aunty Lils" is white Cottage 3rd on Right. 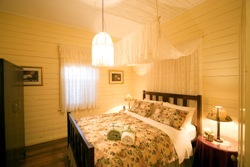 Self contained heritage cottage with historic family links to early bellingen. "Aunty Lils" Cottage provides self-contained accommodation in the heart of Bellingen, close to shops, eateries and restaurants.Your hosts Gus and Gail Raymond are descendants of the pioneering Raymond Family. The original, lovingly restored, family cottage, "Aunty Lils", offers sunny verandahs and a cottage garden with fresh flowers,A breakfast basket,and "the best beds" with lots of pillows and feather doonas. Gail and Gus warmly welcome you for overnight or extended stays. Please visit our extensive website for further details. 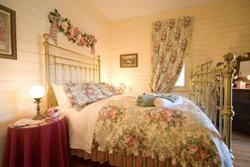 Two Bedrooms with Queen Beds, 1 Bedroom with 2 King Singles. 30 days notice of cancellation required to refund deposit. Within 30 days of arrival a $50.00 fee will be retained.